Decide what you want out of the coconut before everything else. 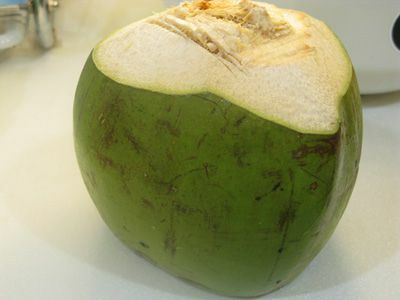 "Young green" coconuts have varying stages of maturity: the youngest ones have the thinnest meat but the sweetest juice. The juice of coconuts with a thicker skin but the meat is still tender and delicious. The more mature green coconuts have meat thicker than a quarter inch which is not tender enough to easily scrape off the husk with a spoon. When you have decided whether you want the coconut meat or juice, or both, tell the vendor exactly what you want it for. Coconut vendors have a way of telling how young a coconut is by simply tapping the dull end of a cleaver against the coconut husk. Once you have your coconut. chill in the fridge for at least two hours if you would like the coconut juice or meat, or both, cold. To cut the coconut to serve the juice in the husk, do the following. (You will need a heavy cleaver. Use the corner sharp point of the blade, closest to the handle, and bring it down through the top of the coconut with some force. This is just the first of four such incisions. The idea is to cut a squarish opening in order to access the juice inside the coconut. If the cleaver doesn't pierce through the husk during your first attempt, do it a few times until it goes right through. We usually do this over the sink as some coconut juice is bound to spill during this first incision. Turn the coconut around at 90 degrees and make another cut with the bottom sharp corner of the cleaver. Do this two more times, each at 90 degrees to the previous one, to get a square opening/lid at the top of the coconut. Put the knife aside once you have cut through the top of the coconut to create a lid-like opening. Use your fingers to pry open the lid. Use a straw to drink straight from the coconut. Add some ice if you like the juice cold. The flesh should be soft and yield easily to the metal spoon. If, by chance, the flesh of your coconut is thick and not so soft, use a knife to cut through the meat to insert a straw. You may need to cut the coconut in half to get to the meat. If you do not intend to serve the coconut juice in the husk, make a clean cut at the top of the coconut to cut through the flesh. Pour the juice into a pitcher. Then chop the coconut into halves to get the meat.